Lately I have written a lot of very serious Weekend Cooking posts. 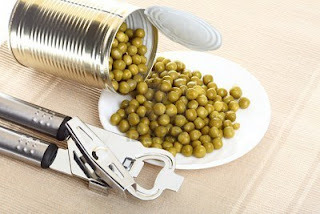 I have written a couple anti-GMO seed rants. I have written a couple about classical literature - Hemingway and Hugo. And, you probably have the impression that I am a very serious, old, intellectual type. And, you are right. No!! NO!! Well, I guess I am a little old - if you are twenty or something. Anyhoo, I decided to seriously lighten up this week. And, besides, I came across the most hysterical food related thing that I just HAD to share. So, without further blathering, I bring you...Late Night Bacon. So, here is the deal, as told by KnowYourMeme.Com -- "In November 2010, celebrity chef and cooking show host Rachael Ray’s Food Network recipe article “Late Night Bacon” suddenly began receiving the attention of trolls who pointed out the article’s verbose instructions on how to cook bacon in the microwave. The recipe article was originally posted in May 2004. Baffled by the overly simplistic recipe, some readers began responding to Ray’s article with tongue-in-cheek reviews of the instruction in the comments section. OK, Libby here again. So, to participate you are to troll the recipes section of FoodNetwork.com looking for silly recipes and then leaving comments! Here is a hint - I read that Rachel Ray has a good one for Pineapple Wedges, and Paula Deen has a "must read" recipe for English Peas. If any of you actually do this, let me know!!! Although they may not wish to claim me this week ;) I am linking this article to Weekend Cooking (see the button in the right column) at BethFishReads.com! LOL...very amusing! I might have a go at this tomorrow! I hope you do - I want to read your FoodNetwork comments - LOL! I always thought that was hoot. So is this, Libby, thanks for the laugh! Cool! I'm going to go look that up! I know! I feel mean, but every time I go on FoodNetwork and read the comments I start laughing so hard my kids come in to see what is going on! No you're not! 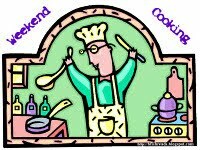 Your Weekend Cooking post today was one of the all time greats! "[...] After sucessfully making this and the Late Night Bacon, I think that I, too, am finally ready to become a TV chef! There was another funny one there about waiting to read a recipe from Rachel on how to boil water or make ice. haha! 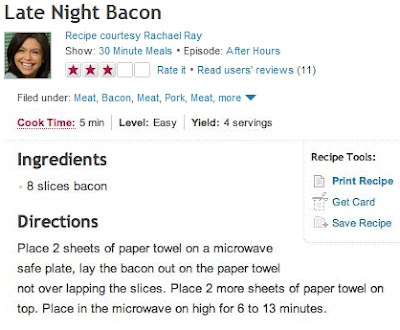 I know, poor Rachael Ray - there is a part of me that feels mean laughing...on the other hand - Late Night Bacon?!?!?!? Hysterically funny food comments. I love the paper towel taste. I'll have to troll the FN's website for other examples. Thanks for alerting me to this meme-it is new to me also. If you find any more good ones, please let me know! That was fun. I liiked the comment about the paper towels not tasting awful. It reminds me that, when I give someone cooking instructions, I need to be very clear. I know - right? Thanks for stopping by! Hee hee. Thanks for sharing this.